Farmers Markets are Opening Up In Your Area! It’s an exciting time of the year isn’t it? Spring time is here and for many folks that means it is time to go to the local farmers market and pick up some farm fresh fruits and vegetables. Of course we’re partial to strawberries but the truth is there are lots of other types of produce and related items that you can purchase at your local market. See more here. Are you ready for farmers’ market season? I know I am, and this year will be action packed. Many of our markets are opening up within the next couple of weeks, and there will be an abundance of delicious local goodies. If you did not buy anything over the winter from our local farms, this will be the time to stock up. To get ready for the season, there are a few things you may want to think about before you go to the market. Go early or at least mid-market hours so that you can get what you want. Build a relationship with the growers, and pre-order your items if you are not an early person. Just get there before the market closes. Most of the grower/vendors would love to have pre-orders so they know exactly what they need to bring. Don’t go late expecting the growers to cut their prices in half. These farmers have spent many hours and hard labor to get you the best products available. There is a very small margin of profit in what they sell you, and sometimes it is even at a loss. If we don’t pay our growers what they need to earn a profit, we will soon lose out on our farmers. Bring a cooler, especially if you plan to grab lunch before heading home. This will keep your frozen meats, seafood and tender fruits and vegetables good for a few hours. If you want to make a conscious effort to buy local, make a meal plan for the week. Start your grocery shopping at the market first. This way you will get the freshest produce (most are picked the day/night before or early on the morning of the market), best price and everything you need. Going to the farmers market is great for your family too. Children love to see all the different fruits and vegetables and interact with all the different people. Plus, you’re also providing fresh fruits and vegetables to your children which is a great way to promote nutrition as well. Retail, Calculating, Or Certified Scales, Which is it? The scales that we usually talk about each month can be referred to as quite a few different names. Some folks call them retail scales while others prefer to say they are scales for computing the price per pound. Others like to say they are calculating scales or certified legal for trade. We generally just call them price computing scales. These products work great at places like fudge shops, candy stores, frozen yogurt stores and farmers markets because the operation of the products is pretty simple. You basically place the item on the scale, enter the price per pound that you wish to charge your customer, and the scale computes the price per pound on both the front display and the back display. This is great because both the farmer or the candy shop owner can see the price and the customer buying the apples or the cup of butter pecan frozen yogurt can see how much they owe. Speaking of yogurt we also should mention that some of the scales can compute price per ounce which is especially useful for sellers looking to charge patrons by the ounce. We have always been a valuable and dedicated retail solutions site for customers. Our fresh food weighing systems product reviews and inside information has helped many customers make a wise decision about their retail scale needs. We encourage you to bookmark our site, subscribe to our RSS feed and hopefully some of the information we provide can assist you in your restaurant or produce selling business. Buy New Produce Scales Or Keep My Old Hanging Scales? A few times a year we’ll get an email or a call from someone who will ask about digital scales. Basically they are fishing for scale knowledge to determine if it makes sense for them to scrap their old hanging scales for weighing fruits and vegetables. In many cases they really want to buy the cool new digital price computing scale like their buddies at the farmers market. They just need a little justification in order to make it “legit”. Honestly, if the used hanging scale is still working it probably has a very long lifespan and could easily last for many years. However, the real selling point with the new and “fancy” digital retail scale is the fact that many of them can calculate the price per pound. This can be a real time savings and can make your operation seem a little more professional in the eyes of your customer. Let’s face it your customers have other options when it comes to buying fresh produce so you want to do everything you can to accommodate them and provide them with the product and service they expect. If you were to sell them some vegetables and then you take out a pencil and paper or you reach for a calculator, the customer is probably not going to be thrilled. Especially when your neighbor two tables down from you has three legal for trade digital scales up and running. His customers orders are processed quickly and efficiently. That is why sometimes we refer to the old hanging scales as vintage produce scales because you just don’t see too many of them. Or, they seem to show up in certain regions of the country. 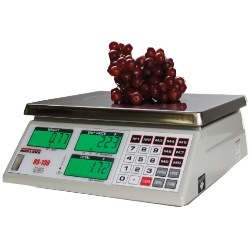 Some of you might be asking when exactly are produce scales used? The simple answer would be that you may use them in a buying or selling commercial situation.